3738 Bixler Church Rd.... Too Late ! Another HomeRome Listing Under Contract! 38 Bixler Church Rd.... Too Late ! Another HomeRome Listing Under Contract! One of my favorite homes, also called The Chocolate House, has found new buyers. They love this house and will be taking possession in less than thirty day. I think it was love at first sight. I am thrilled that these buyers found me through the internet and I was available to show the property this past weekend. They have even agreed to love and feed the two kitties. Living Room as seen from above! Under the garage and driveway deck...a place for storing your boat or other toys! You can narrow the search down to number of bedrooms, lot size, price range, zip code, etc. Be sure to sign up with your email address to ensure daily email updates of properties. These emails will include photos, address and price of the listed homes. 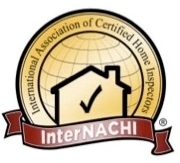 This is a free service to make finding your special Baltimore home easier. I am available to answer any questions or concerns. She Said I "Will" !! About ten days ago I wrote a cute post that received a whole lot of comments. How many is a lot? Over 100! Noticing that Mary Stewart made the 100th comment, I dialed her number. "Congratulations. You just won a copy of Real Estate the Rome Way ,,, Where should I send it?'' We had a lovely chat and I got to know another AR member a bit better. Just look at the hand written that arrived in the mail...the real mail that the Letter Carrier brings and puts in a mail box at your house. How novel! Once again I dial Mary...my turn to say thank you for taking time to write. We had a delightful conversation and I asked and received permission to post the following. 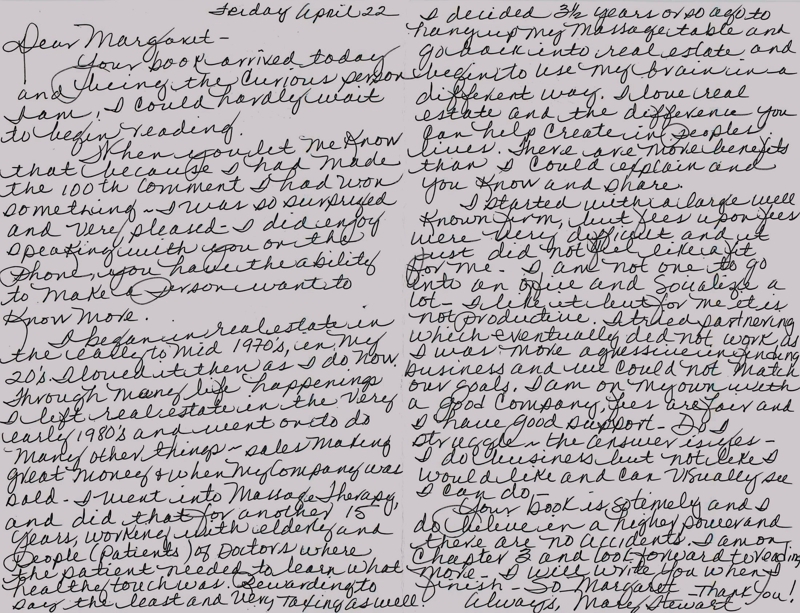 Mary Stewart's handwritten card showing ..the power of a thank you note! Mary Stewart's card with original artwork. 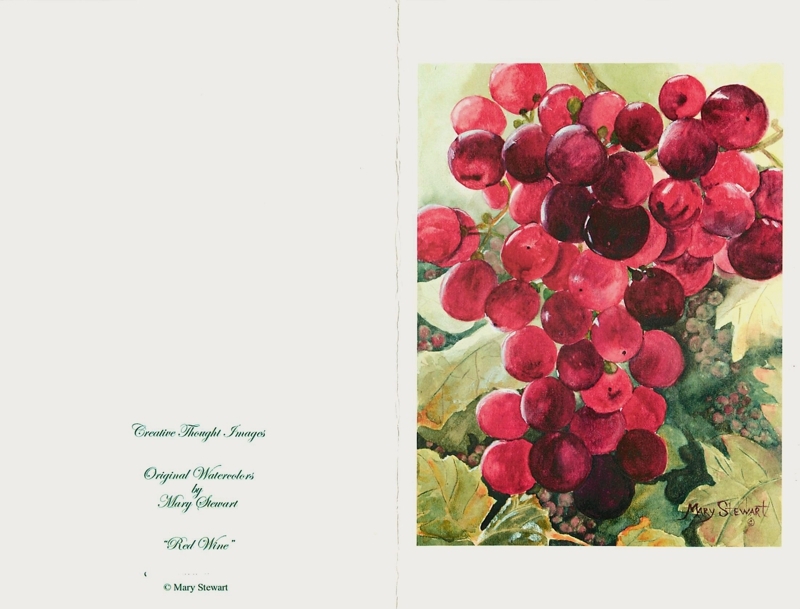 When I really looked at the card, turned it over and saw " Original Watercolors By Mary Stewart" I was impressed. Here is another ActiveRain artist using her talent with hand written notes. If you are lucky enough to be represented by Mary, there is a special piece of art done for you by this artist. Mary is relatively new to ActiveRain...only blogging since February. Being creative makes us stand out! Mary stands out with The Power of a Thank You note! WARNING! Tornado Warning for Baltimore Area. WARNING! There is a tornado warning in Maryland including Baltimore County and Westminster in Carroll County. The wind's up , the sky is dark with clouds and here is what the TV station looks like. Think I will not be going out this morning! Severe thunderstorm warning, flash flood watch and tornado warnings. Please be aware. Keep an eye on the news. Be Safe. You are Invited to an ActiveRain Garden Party Wednesday May 4th to Find Out...What is a Coddie? You are Invited to an ActiveRain Garden Party Wednesday May 4th to find out..What is a coddie? If you are not from Baltimore, you probably have not heard of them. They are small round cakes that are served with saltines and mustard and are homemade at delis like Steve's. When you come to the Garden Party on May 4th..you will all be able to see and taste this delicacy which is native to Baltimore. It has been described as a moist combination of cod flakes, mashed potatoes, and onions.... a concentrated comfort food in miniature. Along with the coddies, there will be sandwiches and Berger Cookies..another yummy treat native to Baltimore. Enjoy the gardens, the pond, the 3.5 acres and the beautiful contemporary home with garage that will hold up to four cars. This pink dogwood tree will greet you at the top of the driveway..so pretty that I had to take a close up of the blossoms. There are lots of whimsy garden sculptures to enjoy. Think that frog might be playing our tune? We could call it an open house, we could call it an ARup . We could call it a garden party, we could call it a Spring celebration, we could call it "coddies and cookies", we could call it a Broker's open, we could call it a general open house, we could call it a HomeRome luncheon, we could call it an ActiveRain get-together. But it really doesn't matter what we call it..we are getting together in Baltimore on May 4th and would love to have you join us! Since I have the title of the The Open House Master and everyone knows I don't do the traditional Sunday open house, we give it another name and make it special. Please join us, there will be sandwiches, coddies and cookies, great company and prizes. Who can guess how many will show up? There are times When An Ad Is More Than An Advertisement. 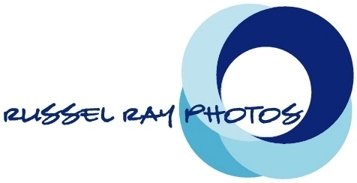 Print advertising is used to bring buyers and sellers to my Internet sites. 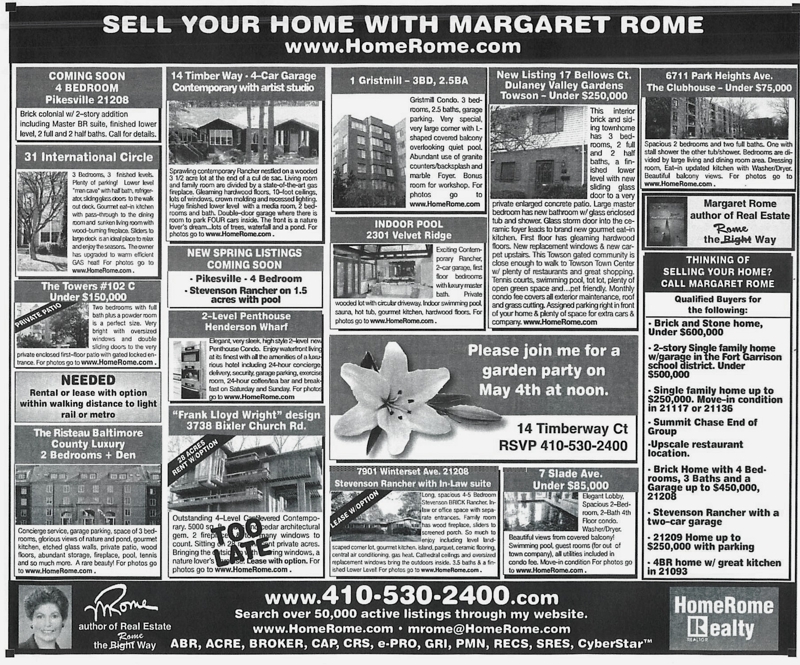 In this Sell Your Home With Margaret Rome print media ad below..my email or website is mentioned sixteen different times. ...and I use it as an invitation for my Garden Party.. Wednesday May 4th! This is a time ....When An Ad Is More Than An Advertisement! There are times When An Ad Is More Than An Advertisement! Searching the MLS is Like Having Your Own Electronic Agent! Try it! It is a Free Service From HomeRome! About a hundred years ago when I was looking for a home, I would call from a sign or ad in the paper to inquire about the price, the number of bedrooms, bathrooms etc. Instead of answering my question, the "duty" agent would question me. "Where do you live? How much do you want to spend? ", What is your phone number?" What is the name of your first born?" ...well maybe not that but I could not just get a question answered! On the rare occassion when I gave up my number, the calls would come in at dinner time trying to sell me something else. It was so frustrating that I resorted to giving a phony name and transposed my phone number. You would not be able to do that with today's technology..well you could block your number. I resented not being able to get simple information and made a vow when I started in real estate to answer any and all questions. Since I resented not being able to get simple information, I did not want to make others feel that same way. So I decided in the beginning of my career to answer callers questions. Callers are frequently surprised when I just answer their immediate question. I give them the price, I give them the location, I give them the schools, I give them the type of heat...I answer their specific concerns. Sometimes I even say you don't have to give me your name or number...feel free to call with your questions or concerns. I have earned more clients over the years with this approach than all the probing questions we have been taught. Try it! It is a Free Service From HomeRome! Russel quotes so much wisdom from his wise old grandmother that if he wrote a book with that title, it would surely be a best seller. You don't have to buy a book, his words are free...just continue to read his wonderful blogs. If I'm not actually working for a Client doing whatever it is that s/he hired me to do, then I can virtually guarantee you that, in some form or fashion, I'm learning, teaching, writing, or helping others. Please make your comment on Russel's blog. If you are not a subscriber...you are missing out big time. My wise old grandmother helped me start my first business when I was ten years old, and one of the first things she said to me was, "If you fail to plan, plan to fail." One of my favorite music personalities, George Harrison of The Beatles, said it a different way on his CD Brainwashed (2002, posthumously): "If you don't know where you're going, any road will take you there." Such sentiments can apply to both business and personal life. I've always been a workaholic, sometimes out of necessity, sometimes simply because I thoroughly enjoyed what I was doing. Although still a somewhat pejorative term, to me a workaholic is simply someone who is addicted to work, either out of necessity or because of a severe love of what s/he is doing. It often applies to the self-employed, many times out of sheer necessity to make an honest living. I currently consider myself a controlled workaholic, a term that, to the best of my knowledge, I coined in 1987. A controlled workaholic is a workaholic who has to plan his personal life to keep his business life from overruning it. So in 1987, when I was forced to become 100% self-employed rather than relying at least partially on an employer to pay me a salary, I conscientiously decided to control my workaholism rather than letting it control me. 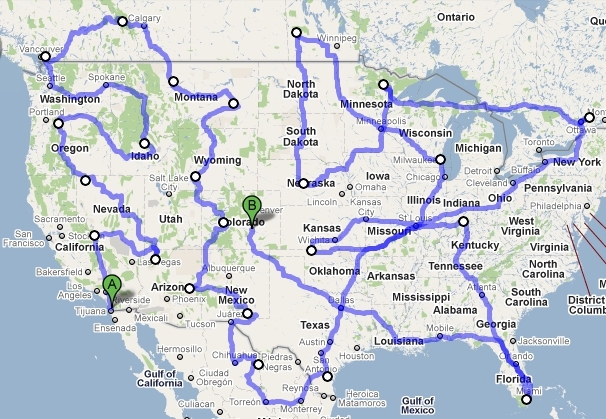 That's when I fell back on what my wise old grandmother had taught me almost a quarter century earlier: Plan. a love of helping others, sometimes even to the extent that I'll do it free or otherwise let it hinder my ability to make a living. The founders and operators of ActiveRain have realized that their points system can easily create workaholics out of people because competition is the whole basis of capitalism and a free-market enterprise system. It's probably the whole basis of society, civilized or otherwise. And competition can sometimes interfere with other aspects of one's life. That's why ActiveRain limits comment points to 250 per day and blogging entries to a maximum of 2,250 automatic points per week. ActiveRain and blogging should not be the only arsenal in your marketing attack, but if you subscribe to it, and I do, it should be a persistent and consistent weapon. But that's true of any weapon in your marketing arsenal. If you haven't started planning yet, well, it's never too late (something else my wise old grandmother told me). In addition to planning what you'd like to accomplish for the rest of 2011, plan what you're going to do each day, each week, and each month to reach those goals, and I'd be willing to bet that you actually do reach them. Every day that you fail to plan puts you one day closer to your plan to fail, and if you don't know where you're going, any road will take you there! Unlocking the secrets of your home — ....but there weren't any birds! Opinion — Why did we change? The Music Chronicles of Russel Ray — Martha, My Dear! How I use a waiting list. 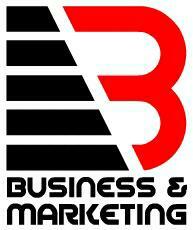 After 2 decades in real estate, my business is 99% referral, and limited to Fifteen listings. In a recent post, Lorrie asked about this. The waiting list is something that started early on when there were people I really wanted to work with and some I didn't. For the 2nd group, I used to say, "I have a waiting list," figuring they would reply, "Forget it!" and go somewhere else. But I found that some sellers were impressed that I was able to turn down a listing, and often they would actually wait to work with me. As a Broker and listing agent, I make all my appointments and contact my sellers. preferring fewer transactions and a higher level of service. I frequently turn down listings making room for better listings. If the commission question arises, I can promise having the highest commission rate. But since my clients come by referral, they already know how I work. How can a new agent adapt this model and use a waiting list for their situation. My advice is to not rush out to take a listing as soon as someone calls. Take the time to get information in advance. Ask how many agents they are interviewing, and try to be the last they talk to. Even say something like, "I have room for one more listing this week." Even if you don't have many listings, that's a true statement. It also keeps you from looking too eager or too desperate. Always be ready to walk away from a listing. Sellers have to answer my two questions with a yes. Are you 100% sure you want to sell your home? Are you 100% sure you want to use me? I have chosen not to do business with people I don't like or don't respect. Don't think of it as turning down a listing; think of it as making room for a better listing. 17 Bellows Ct. 21204 Towson, Maryland Townhouse Condo in Gated Community.. This interior brick and siding townhome has 3 bedrooms, 2 full and 2 half baths, a finished lower level with new sliding glass door to a very private enlarged concrete patio. This lower level would make a great “man cave” for all your entertaining. Large master bedroom has new bathroom with glass enclosed tub and shower. The second and third bedrooms share another new bath also with tub and shower. This home boasts a brand new gourmet kitchen with ceramic floors, white cabinets, granite counters, new stainless steel 'Whirlpool Gold' appliances including a 5 burner gas stove, built in microwave, oversized stainless sink, disposal, dishwasher, and refrigerator. Enter through the glass storm door into the ceramic foyer which leads into the bright eat in kitchen. The first floor has gleaming hardwood floors. The bathrooms are all updated with four TOTO toilets. With new replacement windows, new carpet upstairs and neutral paint, this townhouse condominium is ready to move right in! This Towson gated community is close enough to walk to Towson Town Center with plenty of restaurants and great shopping. No need for a vacation when you have tennis courts, swimming pool, tot lot, plenty of open green space and… Dulaney Towers is pet friendly. The monthly condo fee covers all exterior maintenance, roof, grass cutting so you really can live like you are on vacation. Assigned parking right in front of your home and plenty of space for extra cars and company. Walk out from finished lower level to very private patio.